Heroes, Heroines, and History: Tinkers, Peddlers, Truck Farmers, and Furniture Salesmen. Oh My! Tinkers, Peddlers, Truck Farmers, and Furniture Salesmen. Oh My! 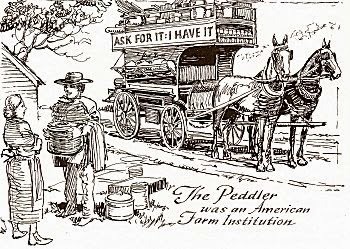 My family and my husband's family have a history of being peddlers and truck farmers. Both my grandfathers sold produce out of their trucks in the summertime. Watermelons, peas, beans, corn, tomatoes, squash, okra, whatever they could grow, but the family didn't eat, so they sold it. They were called "truck farmers". And on some days, they participated in the farmer's markets in neighboring towns, but mostly they went door-to-door and sold their produce. They had routes that they would service. Once my grandfather told me about an old sword he'd traded for. Of course I was in awe of the fact that the sword might be from the Civil War, or some exotic place like Saudi Arabia. I was so enamored of the sword that my grandfather gave it to me instead of to one of my male cousins. It's just an old broken sword. It's not pretty and the grip and handle have been broken off, but maybe someday I'll find somebody who can tell me what time period it came from, or might even be able to repair it for me. My father-in-law and his brothers went even farther afield when peddling. They were known to travel to the Mississippi Delta for a load of sweet potatoes, to Georgia for peaches, and down south Mississippi for watermelons. Anything they thought they could sell, they'd take off and buy it, sometimes driving over 24 hours straight to make the trip. Come to think of it, my stepfather and stepbrother are still peddling, but I just never thought to call it that! They buy trailer loads of Georgia honey and sell it in California. They have a very loyal clientele, and they make 5-6 trips a year distributing honey all over the west. But the most interesting stories my mother has told me is of her cousin, J. L. Jones. J. L. started out with a little country store on skids that he moved around when the notion struck him. If he thought business would be better at the crossroads close to Hudson Chapel Church of God, he sat up shop there. A few months later, he might move three or four miles closer to the main road. Later, he'd move to a new spot. This mobile store was similar to the peddlers who rode all over the country selling everything from pots and pans, to sewing thread, to vanilla flavoring. The only difference was that J. L. was from the community and people knew him. Most were even kin to him. From those humble beginnings, J. L.'s business grew until he opened a very successful furniture store in Jackson, MS, the state capitol. But the traveling salesman that my mother tells me about was welcome when he came down the long, lonely dead-end road she lived on. He brought thread, cloth, seeds, pots and pans, along with news. I suspect both of my grandfathers loved that aspect of truck peddling as much as they loved making the sale. Regardless of the reputation of traveling salesmen, they were a major part of the fabric of America before motorized vehicles made traveling over a few miles a possibility without wasting the entire day. I included a traveling salesman much like J. L. Jones in The Evergreen Bride. My fictional storeowner, Mr. Miller, owns Miller's Mercantile, and he moves the store when the mood strikes. Sipsey couldn’t even be called a town unless you counted the church and the school, along with Mr. Miller’s store, and you couldn’t always count the store. The tiny mercantile consisted of two wagons butted end to end. The space was so tight, you just entered from one end and exited the other, and every nook and cranny was stuffed full of non-perishable foodstuffs, spices, sundry items, and a bit of cloth and thread. Mr. Miller moved his store to a new location whenever the mood struck him. So, there you go. Miller's Mercantile, handy-dandy resource for all your needs. Sure beats traveling ten--or even forty-- miles for a sewing needle or a tube of ointment, doesn't it? 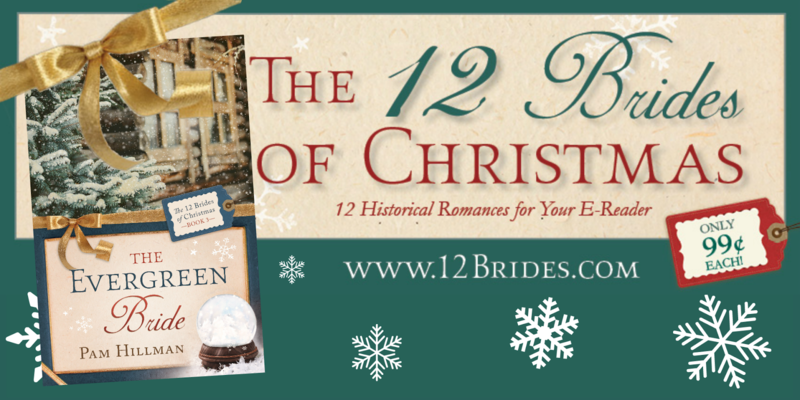 THE EVERGREEN BRIDE by Pam Hillman (Available NOW for pre-order): Mississippian Annabelle Denson dreams of visiting cousins in Illinois and seeing a white Christmas. In the face of her excitement, Samuel Frazier hides his growing affection for her behind a quiet smile and a carpenter’s lathe. Samuel starts to worry that if she goes, Annabelle won’t return. Can he convince her to stay? Hi Pam. Nice article! When I was a girl, men used to come by our house with baked items and milk. I always loved seeing them. I hope you find out about that sword! I enjoyed your post, Pam. My limited knowledge of traveling salesmen did come from the movies, The Music Man in particular. It's nice to hear what life was really like for peddlers, tinkers and "drummers" from someone with firsthand knowledge. Like Rebecca, I hope you learn the story behind that sword your grandfather took in trade. Keli, I'm sure there were all kinds...the honest and friendly, and the shysters, and shysters always make good fodder for movies, don't they? According to census records, my great-great-grandfather was a peddler when he came to Milwaukee from Germany. I think he may have been a teacher in Germany, but peddling was a way to keep food on the table when they began a new life in America. What a great post, Pam! How interesting to hear about your family and this vocation. I really enjoyed it.